All of our Green Wood Collection outdoor gliders, like the Amish Outdoor 24" Contoured Glider Chair, are beautiful. One way to further enhance their beauty is by adding a gliding ottoman. Pairing a gliding ottoman with your outdoor glider chair provides the ultimate rock and relax package. Set up your favorite outdoor retreat on your patio, porch or out by the pool with the perfect place to put your feet up. Skillfully crafted with effortless movement in mind, this outdoor ottoman will elevate your legs, feet, and gliding time to another level. Studies have shown oscillating movement can contribute to lower blood pressure, increased circulation, and the release of endorphins, natural feel good factors for your brain! There's no need to worry about outdoor elements causing your ottoman to waste away. You're purchasing the best outdoor furniture for your home collection with this gliding ottoman. 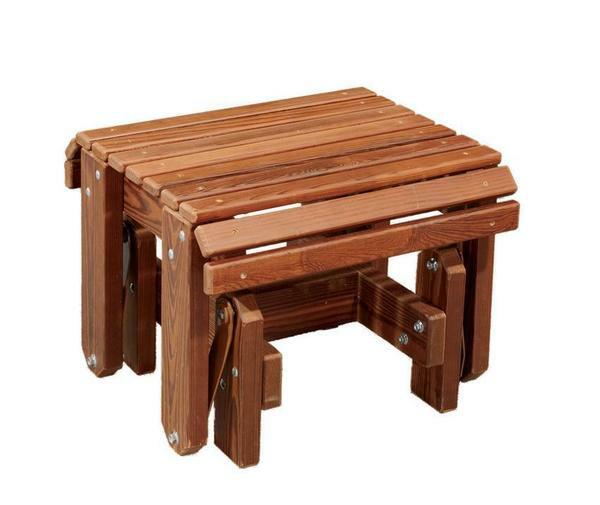 This wood footrest is made with hearty aromatic red cedar wood that naturally resists decay, repels bugs and offers longevity you can count on. This ottoman is also eco-friendly, as it is constructed from wood harvested here in America and is sealed with Pure Wood sealer that contains no chemicals. Add eco friendly to the long list of benefits this outdoor furniture brings with it.